Fermilab is the neutrino capital of the world. The lab's suite of experiments to study the subtle, elusive particle called the neutrino will aid humanity's understanding of the origin of matter, the unification of forces and the Big Bang. Before being detected, neutrinos from Fermilab experiments travel over short distances — several hundred meters — and over long distances — several hundred miles. Fermilab is hosting what will be the largest experiment of its kind when complete: LBNF/DUNE. At Fermilab's flagship experiment DUNE, the Deep Underground Neutrino Experiment, the lab will send neutrinos 800 miles through Earth's mantle to a former gold mine in Lead, South Dakota. Scientists will use giant detectors to study the neutrinos' travel patterns over that distance, recording neutrino interactions at either end of the journey. Scientists will search for new subatomic phenomena and potentially transform our understanding of neutrinos and their role in the universe. The Long-Baseline Neutrino Facility will provide the neutrino beamline and the infrastructure that will support the DUNE detectors. Our universe is permeated with neutrinos — nearly massless, neutral particles that interact so rarely with other matter that trillions of them pass through our bodies each second without leaving a trace. While small and antisocial, neutrinos are the most abundant particle with mass in the universe — so the sheer number of them could have a powerful collective effect. Their odd properties could be a clue to a deeper understanding of the most fundamental physics in the universe, which is why Fermilab has put together a suite of world-leading experiments. Neutrinos, first discovered in 1956, come in three flavors (or types) and have some mysterious characteristics. They have puzzlingly low masses when compared to other elementary particles, and they are able to oscillate, or change from one type of neutrino to another. The Standard Model, the best description of the fundamental particles and forces that make up our universe, predicted that neutrinos would have no mass. However, we know from oscillation experiments that neutrinos do have tiny masses. It could be that neutrinos are the only fundamental particles that gain their mass from a source other than the Standard Model Higgs field. Neutrinos could have other strange properties as well. They could turn out to be identical to antineutrinos, their antimatter counterparts. They could be related to massive particles that theorists think might have greatly influenced the formation of our universe. Studying neutrinos could tell us about other areas of physics. They could give us insight into why particles seem naturally to be organized into three generations. They could help reveal undiscovered principles of nature. Scientists at Fermilab have been involved in neutrino research since the 1970s. In 1999, the laboratory broke ground on its first long-baseline neutrino experiment, MINOS, which studied the oscillation of muon neutrinos to tau neutrinos into other flavors. The DONUT experiment at Fermilab made the first ever direct observation of a tau neutrino in 2000. Learn more about Fermilab experiments below and visit the Fermilab Neutrino Division website. And for a thorough primer on neutrino physics, visit All Things Neutrino. All Things Neutrino is a comprehensive site that covers the history, science and intrigue behind these subtle particles. The Deep Underground Neutrino Experiment, DUNE, is an international neutrino experiment that will be the largest of its kind. DUNE aims to make definitive determinations of neutrino properties, the dynamics of the supernovae that produced the heavy elements necessary for life and the possibility of the proton decay predicted by many grand unified theories. DUNE research will be conducted with the international Long-Baseline Neutrino Facility, LBNF, at Fermilab and the Sanford Underground Research Facility in South Dakota. The Short-Baseline Neutrino Program at Fermilab will look for a fourth kind of neutrino, one that may not follow the rules of neutrino interactions shown by the other known three. When construction is complete, a chain of three particle detectors — ICARUS, MicroBooNE and SBND — will probe a beam of neutrinos created by Fermilab's particle accelerators. MicroBooNE, the middle detector, is currently operational. It is a multiton liquid-argon detector and uses the same technology that will be used for DUNE. ICARUS, was installed at Fermilab in 2018 after undergoing refurbishment at the CERN research center in Switzerland. SBND, which will sit closest to the source of the neutrino beam, will be a 260-ton liquid-argon detector. Together these three detectors will be powerful tools to investigate in great detail the evolution of neutrino oscillations over short time and distance. Fermilab's NOvA experiment sends a beam of neutrinos to a 14,000-ton particle detector a record-breaking 500 miles away in Minnesota. NOvA is studying the oscillation of muon neutrinos to electron neutrinos with the goal of deterining the ordering of neutrino masses and discovering whether neutrinos and antineutrinos oscillate at different rates. MINERvA was a neutrino-scattering experiment that used a variety of target materials to search for low-energy neutrino interactions. 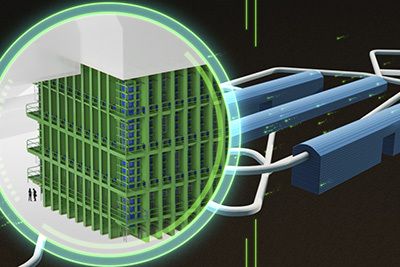 It was designed to study neutrino-nucleus interactions with unprecedented detail. The data are still being analyzed and used to expand our knowledge of neutrinos and improve precision analyses in current and future detectors. MINOS was a neutrino oscillation experiment with a far detector located in a former mine in Minnesota. Scientists are still studying the data from MINOS to better understand neutrino oscillations, in particular, by measuring the disappearance of muon neutrinos and the appearance of electron neutrinos.